This year’s best picture nominees offer glimpses into different lives and compelling stories, and they also offer up some lessons for public relations professionals. So, time spent watching movies this year can definitely be categorized as professional development, right? Here’s a light look at what we can learn from the films that captured moviegoing audiences this past year. 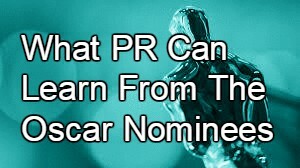 PR Takeaways from top films. Call Me By Your Name explores a coming-of-age story set in 1983, involving the relationship between the young teenage son of an archeologist and his visiting student. The two fall in love over the summer and explore this “friendship” against the beautiful backdrop of northern Italy. What’s notable about the film, for anyone who writes for a living, is its masterful use of language. The script runs the gamut of creative and powerful wordplay, including scholarly quotes from the poet Marguerite de Navarre and lots of German and French bons mots. As we have noted, the best way to improve writing is to read a variety of texts, from creative to journalistic. In this case, we add, and watch certain films. Leadership is at the heart of The Darkest Hour‘s brilliant portrayal of Winston Churchill. Churchill was a remarkable and respected “once-in-a-lifetime” prime minister for Britain whose ability to make the tough calls during the dark days of the war angered some initially, but ultimately earned him an unmatched place in history. Above all, through speeches, radio addresses, and his writings, Churchill presaged the modern business or political leader bent on making his mark through strategic thought leadership. In addition to negotiating critical treaties and agreements, Churchill arguably left the world with more spectacular quotes than almost any other Brit save his compatriot William Shakespeare. Dunkirk tells the true story of the brave way everyday British citizens joined the armed forces to bring imperiled soldiers home during WWII. The film makes strong use of very personal stories, like that of the Mark Rylance character who took a small fishing boat and miraculously ferried home surviving soldiers. Today’s most effective PR relies on emotional storytelling to make connections with consumers. While they won’t always be as dramatic as those in Dunkirk, even simple tales like that of Deshaun Watson, the rookie quarterback of the Houston Texans, can resonate. We like a lot about this first feature film from Jordan Peele. It’s notable as only the second horror film in years to be nominated for Best Picture. Then, too, Peele coined a new term for the genre that the scary- good film belong in – social thriller. But from a PR standpoint, we most appreciate how the film gave a terrific shoutout to beleaguered TSA agents everywhere and how the organization says it has benefited from the movie. Without spoiling anything, suffice to say, a brave (and very funny) TSA agent comes to the rescue of our protagonist. A perfect example of how third-party “earned media” can boost an image in a way advertising just can’t. Underneath its lovely dissection of a high school student’s relationships with her family, friends and teachers, Lady Bird is a story of reinvention. The lead character, Lady Bird, played with tremendous pathos and humor by nominee Saoirse Ronan, is bent on getting out of her humdrum hometown of Sacramento and shedding her small town persona to become more sophisticated. She changes her name and friends and rejects her parents’ advice, resulting in some sad consequences. But it’s all a learning experience, as our heroine sets out to leave it behind for school in New York. As a PR practitioner, I couldn’t help but think about the times a client has sought to reinvent a personal or corporate brand. Bottom line, if it’s not authentic, it will probably fail. This look into a quirky and somewhat dangerous relationship between a brilliant dress designer and the woman who becomes his muse has so much going for it. Written and directed by Paul Thomas Anderson and starring Daniel Day-Lewis in what he claims will be his last film, the picture is visually beautiful, haunting and even funny. Those of us in PR will want to know how the designers of the late 50s period obtained and kept their wealthy clients. In the case of the Day-Lewis character, it seems to be a combination of face-to-face meetings at his opulent home/studio combined with intimate fashion shows. Most relevant to PR, the characters pride themselves on knowing their clients’ needs and offering over-the-top service and attention to detail. Witness the “all-nighter” the seamstress team engages in to repair a bridal gown – we’ve all been there (sort of). This true story of the struggle of Ben Bradlee and Katherine Graham when deciding whether to publish the Pentagon Papers is of obvious interest to PR pros. It’s a study in relationships between reporters and sources and tells the story of how editors and publishers grapple with hugely consequential and ethically murky editorial decisions. In the era of Wikileaks and social media, the entire episode feels very quaint. There’s no doubt that today, the “Papers” would have found their way to the public much more quickly. But one thing that hasn’t changed? The role of the leaker/whistleblower in this pre-Watergate tale is relevant to our news cycle, as we witness in White House coverage on a constant basis. In Guillermo Del Toro’s fantasy love story between a mute cleaner and an “amphibian man” at the height of the Cold War, sea creatures really get a bad rap. The government tortures the “asset” (as the creature is called), and you know a cruel death and vivisection are on the horizon. If only there had been a smart PR person in the room to create a “save the sea creature” campaign. This strategic CSR initiative could have done so much to improve the FBI’s creepy image during this time where sexism, racism and homophobia prevailed. It could be argued the institution could use some image-burnishing right now. The heroine of Three Billboards Outside Ebbing, MO has grown so frustrated with the local police department’s inability to solve her daughter’s murder that she embarks on a multi-media campaign to light a fire under law enforcement. Best Actress nominee Frances McDormand’s character has a clear objective and some sensible strategies. She also uses questionable tactics, including those “three billboards” that call out the local police chief, local press statements, and public shaming. Despite the twisted and revenge-fueled PR campaign she mounts, we do applaud her resolve.